Here is list of ingredients. Pizza actually has no limitation on ingredients, you can literary add in anything you can think of, some green vegetable such as rocket is highly recommended. You may replace with seafood, add in prawn will be good idea as well. I use Pasta tomato puree which is already season to taste, personally I found it to be a little bit too sweet. I recommend to purchase pure tomato puree and adjust taste based on your preference. Making of Pizza Dough is actually pretty simple. – Mix 2 cup of warm water with Yeast and let it rest for few minutes, you should see some bubble coming up. If no bubble which mean the yeast is not active, don’t waste your ingredients, start new yeast and make sure got bubble. – Mix in the rest of the ingredients and let it rest for 1hour or double in size. – You may cover it and let it rest anywhere or personally I prefer to just throw it into oven (without turn on), I stay at Malaysia where temperature around 30+ Celsius. 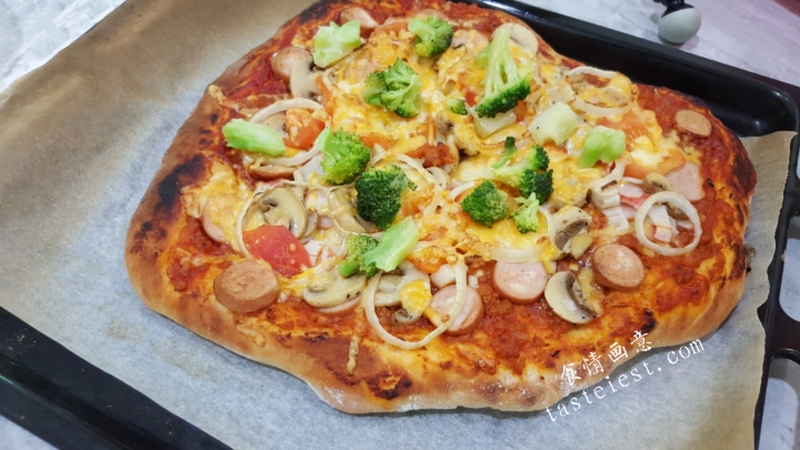 – Most of the pizza topping need to be cook up front because baking Pizza just take around 7 to 10 minutes which might not enough for some ingredients to fully cooked. – Pizza topping can be anything but the tomato based with pork is highly recommended, it add extra texture and flavor to it. – You may skip butter if you don’t wan your pizza to be too greasy but personally I found adding butter make it more fragrance. – I always applied tomato puree and mince pork at bottom layer follow with whatever ingredients of my choice. – My house left with Cheddar so for this Pizza it only has Cheddar which is great in taste but lack of the springy, chewy texture. – I baked in 220 Celsius with Top & Bottom option for 7 minutes. – Green such as broccoli or Rocket leaf always has to be add after cook or 1 min before cooked, else it will turn black easily. I hope you enjoy our recipe and find it easy to follow, feel free to comment and give us a thumb up. Subcribe to our channel for more recipe. Pop over to our Facebook http://www.facebook.com/tasteiest and give us a Like.